Coal gas is a flammable gaseous fuel made from coal and supplied to the user via a piped distribution system. Town gas is a more general term referring to manufactured gaseous fuels produced for sale to consumers and municipalities. It is also known as manufactured gas, syngas , hygas, and producer gas in some countries. In the days of gas lighting it was also known as "illumination gas," although this term largely fell out of use before the Second World War. Originally a by-product of the coking process, coal gas was extensively exploited in the 19th and early 20th centuries for lighting, cooking and heating. The development of manufactured gas paralleled that of the industrial revolution and urbanization; and the byproducts, coal tars and ammonia, were at some times an important chemical feedstock for the dye and chemical industry. The whole rainbow of artificial dye colours is made from coal gas and coal tar. Depending on the processes used for its creation, coal gas is a mixture of the calorific gases: hydrogen, carbon monoxide, methane and volatile hydrocarbons, with small amounts of noncalorific gases - carbon dioxide and nitrogen - as impurities. Coal gas plants, especially those that operated in the past, are commonly referred to, by environmental professionals and within the utility industry, as Manufactured Gas Plants or "MGPs." Prior to the development of natural gas supplies and transmission systems during 1940s and 1950s, virtually all fuel and lighting gas used in both the United States and Great Britain was manufactured from coal. In the case of Britain, the discovery of large reserves of natural gas in the North Sea in the early 1960s led to the expensive conversion or replacement of all the nation's gas cookers and gas heaters during the late 1960s in order to utilize this newly-supplied energy source. Not surprisingly, the new gas was referred to as "North Sea" gas. Manufactured gas can be made by two processes: carbonization or gasification. Carbonization refers to the devolatilization of an organic feedstock to yield gas and char. Gasification is the process of subjecting a feedstock to chemical reactions that produce gas. The first process used was the carbonization and partial pyrolysis of coal. The off gases liberated in the high-temperature carbonization (coking) of coal in coke ovens were collected, scrubbed and used as fuel. Depending on the goal of the plant, the desired product was either a high quality coke for metallurgical use, with the gas being a side product or the production of a high quality gas with coke being the side product. Coke plants are typically associated with metallurgical facilities such as smelters, and blast furnaces, while gas works typically served urban areas. A facility used to manufacture coal gas, carburetted water gas (CWG), and oil gas is today generally referred to as a manufactured gas plant (MGP). In the early years of MGP operations, the goal of a utility gas works was to produce the greatest amount of illuminating gas. The illuminating power of a gas was related to amount of soot-forming hydrocarbons (“illuminants”) dissolved in it. These hydrocarbons gave the gas flame its characteristic bright yellow color. Gas works would typically use oily bituminous coals as feedstock. These coals would give off large amounts of volatile hydrocarbons into the coal gas, but would leave behind a crumbly, low-quality coke not suitable for metallurgical processes. Coal or coke oven gas typically had a calorific value (CV) between 10 and 20 MJ/m³ (250-550 Btu/ft3 (std)); with values around 20 MJ/m³ (550 Btu/ft3 (std)) being typical. The advent of electric lighting forced utilities to search for other markets for manufactured gas. MGPs that once produced gas almost exclusively for lighting shifted their efforts towards supplying gas primarily for heating and cooking, and even refrigeration and cooling. The problem of nitrogen dilution was overcome by the blue water gas (BWG) process, developed in the 1850s by Sir William Siemens. The incandescent fuel bed would be alternately blasted with air followed by steam. The air reactions during the blow cycle are exothermic, heating up the bed, while the steam reactions during the make cycle, are endothermic and cool down the bed. 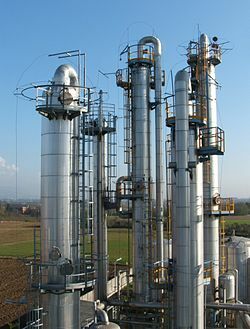 The products from the air cycle contain non-calorific nitrogen and are exhausted out the stack while the products of the steam cycle are kept as blue water gas. This gas is composed almost entirely of CO and H2, and burns with a pale blue flame similar to natural gas. BWG has a CV of 11 MJ/m³ (300 Btu/ft3 (std)). Because blue water gas lacked illuminants it would not burn with a luminous flame in a simple fishtail gas jet as existed prior to the invention of the Welsbach mantle in the 1890s. Various attempts were made to enrich BWG with illuminants from gas oil in the 1860s. Gas oil (an early form of gasoline) was the flammable waste product from kerosene refining, made from the lightest and most volatile fractions (tops) of crude oil. In 1875 Thaddeus S. C. Lowe invented the carburetted water gas process. This process revolutionized the manufactured gas industry and was the standard technology until the end of manufactured gas era. A CWG generating set consisted of three elements; a producer (generator), carburettor and a super heater connected in series with gas pipes and valves. During a make run, steam would be passed through the generator to make blue water gas. From the generator the hot water gas would pass into the top of the carburetor where light petroleum oils would be injected into the gas stream. The light oils would be thermocracked as they came in contact with the white hot checkerwork fire bricks inside the carburettor. The hot enriched gas would then flow into the superheater, where the gas would be further cracked by more hot fire bricks. Mantles in their unused flat-packed form. The post-war house building programme put gas at a disadvantage. Whereas electricity had long developed a national distribution grid, which enabled supplies to reach even small new housing developments, gas was still distributed only locally. Many new housing estates were beyond the reach of the gas main and the stringent Treasury rules about return on investment made extension of mains uneconomic. Electricity made inroads into the home heating market with underfloor heating and night storage heaters using cheap off-peak electricity supplies. By the 1960s, manufactured gas, compared with its main rival in the energy market, electricity, was considered "nasty, smelly, dirty and dangerous (to quote market research of the time) and seemed doomed to lose market share still further, except for cooking where its controllability gave it marked advantages over both electricity and solid fuel. The development of more efficient gas fires assisted gas to resist competition in the market for room heating. Concurrently a new market for whole house central heating by hot water was being developed by the oil industry and the gas industry followed suit. Gas warm air heating found a market niche in new local authority housing where low installation costs gave it an advantage. These developments, the realignment of managerial thinking away from commercial management (selling what the industry produced) to marketing management (meeting the needs and desires of customers) and the lifting of an early moratorium preventing nationalised industries from using television advertising, saved the gas industry for long enough to provide a viable market for what was to come. In 1959 the British Gas Council demonstrated that liquid natural gas (LNG) could be transported safely, efficiently and economically over long distances by sea. The 'Methane Pioneer' shipped a consignment of LNG from Lake Charles, Louisiana , USA, to a new LNG terminal on Canvey Island and customers there were converted to use the new fuel. A 320 mile long high-pressure trunk pipeline was built from London to Leeds. The slow death of the town gas industry in the UK was signalled by the discovery of natural gas, by the ill-fated BP drilling rig Sea Gem on 17 September 1965 some forty miles off Grimsby , over 8000 feet below the sea bed. Subsequently the North Sea was found to have many rich gas fields on both sides of the median line which defined which nations should have rights over the reserves. The Fuel Policy White Paper of 1967 (Cmd. 3438) pointed the industry in the direction of building up the use of natural gas speedily to 'enable the country to benefit as soon as possible from the advantages of this new indigenous energy source'. As a result there was a 'rush to gas' for use in peak load electricity generation and in low grade uses in industry. The effects on the coal industry were very significant; not only did coal lose its market for town gas production, it came to be displaced from much of the bulk energy market also. The exploitation of the North Sea gas reserves, entailing landing gas at Easington , Bacton and St Fergus made viable the building of a national distribution grid, of over 3000 miles, consisting of two parallel and interconnected pipelines running the length of the country. All gas equipment in the whole of the UK was converted (by the fitting of different-sized burner jets to give the correct gas/air mixture) from burning town gas to burn natural gas (mainly methane) over the period from 1967 to 1977 at a cost of about £100 million including the writing off of redundant town gas manufacturing plants. All the gas using equipment of almost 13 million domestic, 400 thousand commercial and 60 thousand industrial customers was converted. Many dangerous appliances were discovered in this exercise and were taken out of service. The British town gas industry died in 1987 when operations ceased at the last town gas manufacturing plants in Northern Ireland. (Belfast, Portadown and Carrickfergus) Carrickfergus gas works is now a restored gas works museum. The Portadown site has been cleared and is now the subject of a long term experiment into the use of bacteria for the purpose of cleaning up contaminated industrial land. As well as requiring little processing before use, natural gas is non-toxic; the carbon monoxide (CO) in town gas made it extremely poisonous, accidental poisoning and suicide by gas being commonplace. Poisoning from natural gas appliances is only due to incomplete combustion, which creates CO, and flue leaks to living accommodation. As with town gas, a small amount of foul-smelling substance (mercaptan) is added to the gas to indicate to the user that there is a leak or an unlit burner, the gas having no odour of its own. During the era of North Sea gas, much of the original cast iron gas pipes installed in towns and cities for town gas have been replaced by plastic. As reported in the DTI Energy Review 'Our Energy Challenge' January 2006 North Sea gas resources have been depleted at a faster rate than had been anticipated and gas supplies for the UK are being sought from remote sources: a strategy made possible by developments in the technologies of pipelaying that enable the transmission of gas over land and under sea across and between continents. Natural gas is now a world commodity. Such sources of supply are exposed to all the risks of any import. There are still substantial coal reserves in the UK and this fact prompts the thought that at some time in the future, coal gas may once again be a reliable indigenous source of energy. In many ways, Germany took the lead in coal gas research and carbon chemistry.With the labours of Hoffman, the whole German chemical industry emerged.Using the coal gas waste as feedstock, researchers developed new processes and synthesizednatural organic compounds such as vitamin C and aspirin. The German economy relied on coal gas during the Second World War as petroleum shortages forcedNazi Germany to develop the Fischer-Tropsch synthesis to produce synthetic fuel for aircraft and tanks. The Pacific coast process has significant problems with lampblack. 20 to 30 lb/1000 ft³ (300 to 500 g/m³) of oily soot can be created during combustion. Major pollution problems led to the passage of early state-level environmental legislation. Loss of high-quality gas oil (used as motor fuel) and feed coke (diverted for steelmaking) leads to massive tar problems. CWG tar is less valuable than coal gasification tar as a feed stock. Tar-water emulsions are uneconomical to process due to unsellable water and lower quality by products. : CWG tar is full of lighter PAH's, good for making pitch, but poor in chemical precursors. Various "back-run" procedures for CWG generation lower fuel consumption and help deal with issues from the use of bitumious coal in CWG sets. Development of high-pressure pipeline welding encourages the creation of large municipal gas plants and the consolidation of the MG industry. Sets the stage for rise natural gas. 1936 or so. Development of Lurgi gasifier. Germans continue work on gasification/synfuels due to oil shortages. The Public Utility Holding Company Act of 1935, in the USA, forces break up of integrated coke and gas companies in the United States. Fischer-Tropsch process for synthesis of liquid fuels from CO/H2 gas. Haber-Bosch ammonia process creates a large demand for industrial hydrogen. Decline in creosote use for wood preserving. Direct coal/natural gas injection reduces demand for metallurgical coke. 25 to 40% less coke is needed in blast furnaces. BOF and EAF processes obsolete cupola furnaces. Reduce need for coke in recycling steel scrap. Less need for fresh steel/iron. Cast iron & steel are replaced with aluminum and plastics. Pthalic anhydride production shifts from catalytic oxidation of naphthalene to o-xylol process. Development of process to make methanol via hydrogenation of CO/H2 mixtures. SASOL coal process plant in South Africa. In the UK , coal gas specifically means gas made by the destructive distillation of coal. The term is not applied to other coal-derived gases, such as water gas, producer gas and syngas. US usage may be different. Coal gas was introduced in the UK in the 1790s as an illuminating gas by the Scottish inventor William Murdoch and became very widely used for lighting, cooking, heating and powering gas engines. Coal was heated in a retort and the crude gas was passed through a condenser to remove tar and a scrubber to remove other impurities. The residue remaining in the retort was coke. The by-products of coal gas manufacture included coke, coal tar, sulfur and ammonia and these were all useful products.Dyes, medicines such as sulfa drugs, saccharine and sugar free soda drink, and dozens of organic compounds are made from coal gas. Coke is used as a smokeless fuel and for the manufacture of water gas and producer gas. Coal gas was initially manufactured by independent companies but many of these later became municipal services. Both the private and the municipal companies were nationalised under The Gas Act 1948 and further re-structuring took place under The Gas Act 1972. For further details see British Gas plc. Coal gas is no longer made in the UK. It was replaced first by gas made from oil and later by natural gas from the North Sea . Everard, Stirling (1949). The History of the Gas Light and Coke Company 1812-1949. London: Ernest Benn Limited. (Reprinted 1992, London: A&C Black (Publishers) Limited for the London Gas Museum. ISBN 0-7136-3664-5). Barty-King, H. (1985). New Flame: How Gas changed the commercial, domestic and industrial life in Britain from 1783 to 1984. Tavistock: Graphmitre. Peebles, Malcolm W. H. (1980). Evolution of the Gas Industry. London and Basingstoke: Macmillan. Fressoz, J.B.(2007), "The gas lighting controversy, technological risk, expertise and regulation in Paris and London, 1815-1850", Journal of Urban History, vol 33: 729-755.